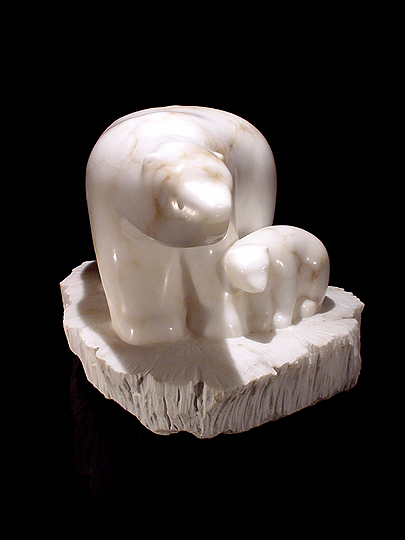 I first saw this sculpture in 1993 (I think... memory fades with time), when my sister Lee was working at the gallery. I loved this sculpture the instant I saw it, and went to the gallery to see it every time I visited Annapolis. 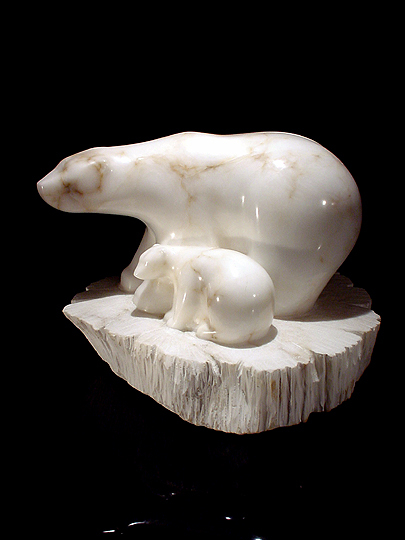 Every time I visited the gallery, I told the owner, "Someday I'm going to buy that sculpture." When I visited the gallery in November 1997, I made my usual comment about the sculpture. The owner told me that another customer had been doing the same thing for years... visiting the gallery occasionally and talking about buying the sculpture. So, in December 1997, I finally made the decision to purchase the bears, before somebody else got them. This is one of my favorite works of art... especially since it was so long coming. One thing I really like about this sculpture is that it is so stylized. The artist did not attempt to add much detail to the bears themselves... you get a bear shape, but no fur or eyes or anything like that. The polar bear, or ursus maritimus (Latin for "maritime bear", because they spend so much time on the ocean), is one of the most magnificent creatures on the planet, as well as the most ferocious carnivore on land. I love polar bears because they are so beautiful and because they have so much personality. Check out any of the nature shows on the Discovery Channel to see what I mean... when they're not attacking something, they can be quite amusing to watch. Also, because they are basically monochrome (lemony white fur, black eyes), they just look cool (pun intended) to me. 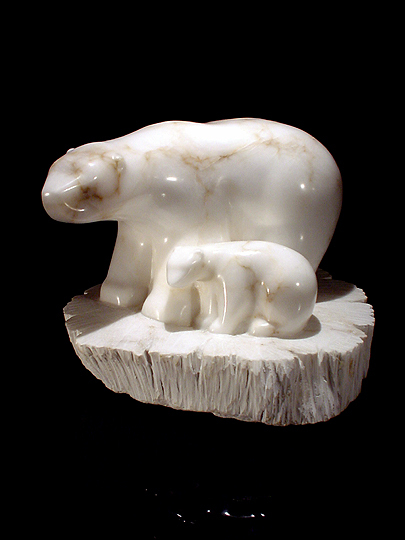 The two bears in this sculpture are a mother and her cub; a male polar bear would instantly kill a cub (even his own) given the opportunity. Scroll down to see more shots of this work.